AYIA THEKLA Luxury Villa close to Beach. Sleeps up to 6 from €520 p/w. This is a two-bedroom top floor apartment with stunning views of the surrounding village of Oroklini. Furnished to a very high standard with quality and luxury furnishings, this apartment sleeps up to four guests. Fully equipped kitchen with all utensils, washing machine, oven and hob and large fridge-freezer. Comfortable and luxury sofas with large TV and DVD. The lounge has patio doors giving access to the large balcony for outside dining and relaxing with views over the village. The main bedroom again furnished to a high standard has a king size bed and access to a small balcony overlooking countryside. Plenty of wardrobe space available with all quality bed linen and towels supplied. Twin bedroom has two single beds and furnished to a high standard, this room also has access to the front balcony. Bathroom available with overhead shower unit. Set on a complex which has a large swimming pool and sun loungers for guest enjoyment, this top floor apartment is a delightful property for holiday rental. If you are interested in renting property 1142, please fill in and submit this form and we will contact you shortly, or please use our contact form if you also want to send us a message, quoting Ref 1142. The main area of Orkolini offers a range of shops, inlcuding a 24 hour bakery, a supermarket, a bank, a chemist, an animal range with horse and donkey rides and even go-karting. The village also boasts a range of fine tavernas. A five minute drive away you will find the beaches which have been endowed with the internationally recognised Blue Flag Award. Larnaca town centre is 10 minutes away by car, with its promenade and marina. 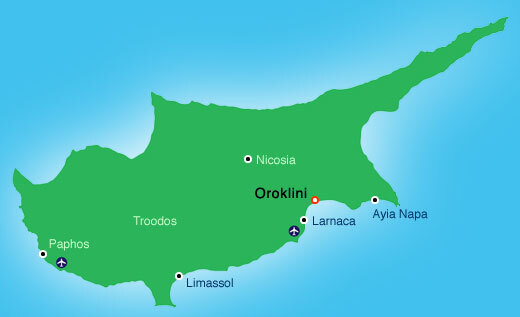 Ayia Napa is 20 minutes by car, where you will find a variety of nightlife. Nicosia, the capital city and still divided since the 1974 invasion, is a 30-40 minutes drive.